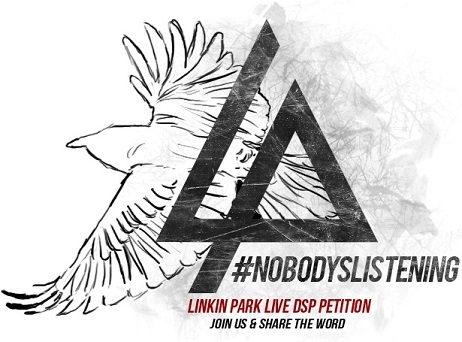 You probably saw our "open letter" in March 2013, signed by many Linkin Park fansites, to try and get Linkin Park to continue releasing their live show recordings online. Two and a half years later, our final attempt is here...a change.org petition to see exactly how many signatures of support we can get and to offer ideas to fix the (broken) DSP program. The Digital Souvenir Packages (and live CDs) were released from 2007-2012. "From 2007 to 2012, Linkin Park released live recordings of their shows for fans to relive the experiences of their shows again. This petition is to bring those back so fans from all over the world can have another opportunity to live in the moment again." We've heard through the grapevine that Linkin Park has at least considered some sort of release of live material in the past year or two, and we thought this would be a good opportunity to get the discussion going. We spent the last few months going back-and-forth with staff members and community members on possible ideas to make the program better for both the band and their fans. If you're supportive of the cause, let's do it together. Read the full petition, including our proposed changes, and sign it HERE. Just signed, fingers crossed now! Hope this time will work. This has new ideas, not just some idea to "omg, release shows"....this will make it easier on the band, management, crew, and fans. The goal should be changed I think lol. It'll hit 100 by today. Change.org has apparently changed (lol) and you can't set actual goals anymore. We're going for 10,000. Signed and even left a message, hope this helps! Signed, I'd love to see if we can get any response from this. Signed and tweeted. Hoping for success! If I were you I would change the banner of the main site for that one, make it the first thing that everyone sees when you open LPL, I'm really excited about this we can make 10,000 for sure. This is great, let's get it done. Totally agree 100% Also, have you talked to LPA about this? I'm sure they would be glad to help. I posted this on my website, too. So Iranian fans will sign this. 600 already. First goal is 1,000. Thanks everyone! 1,000! Great job guys. Pooch just shared it, too. It's getting great attention. Signed and shared into the Linkin Park community right here in Portugal. I am wondering how many copies of one show they have to sell in order to get at least even. That's probably pretty much the number we have to reach for any chance at all.